*Ordinarily this gage is used as a comparator. The actual measuring range of the instrument is 38mm/1.50in. If the gage is used for direct linear measurement, chordal errors may need to be corrected. 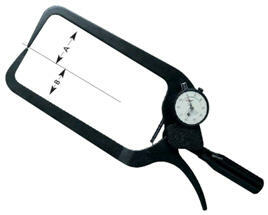 The most widely used gages for checking medium tolerance dimensions on patterns, castings, forgings, dies, sheet metal. Generous clearance on jaws reaches over non-measured part protrusions for easy access to areas where thickness must meet critical dimensional specs. Retraction lever is conveniently located for one-hand operation. .02 mm or .1mm/.01in, .001 in, or 1/64in grads. available. Continuous reading dials with revoltuion counters normally provided. Cylindrical radius steel contact tips normally furnished. Series 49P and 149P Caliper Gages have many design possibilities. Specially shaped arms of various lengths can be designed to reach inaccessible spots or get around obstructions to make measurements possible which might otherwise go unchecked. Contact for alternate contact shapes or materials, alternate capacities and gaging depths, and special designs to meet your application.